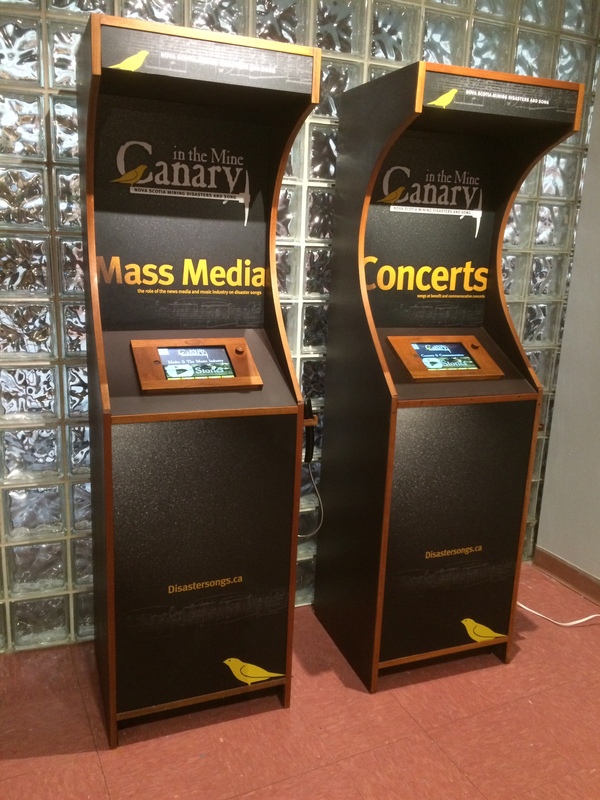 I’m delighted to announce the completion of the exhibit entitled “Canary in the Mine: Nova Scotia Mining Disasters and Song”! 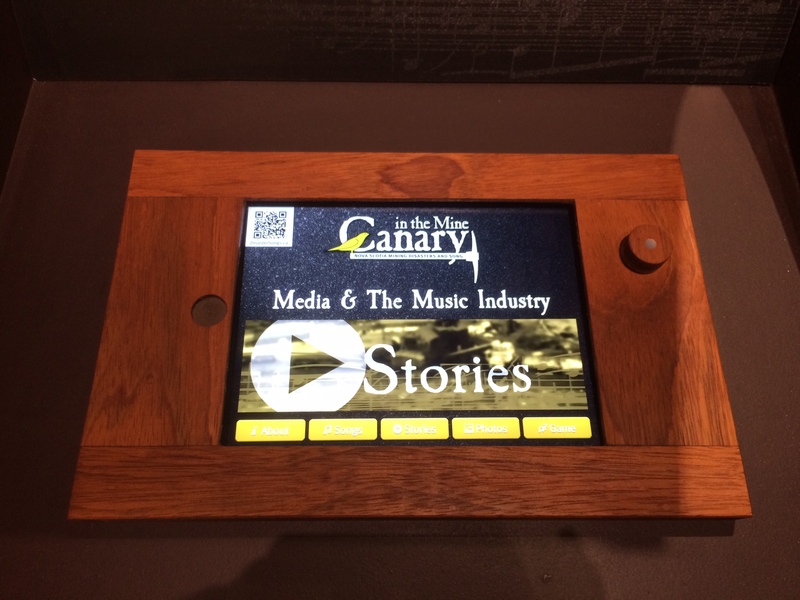 Housed on four iPads and mounted on four kiosks, it will be travelling to various venues over the coming years. It just finished its debut at the CBU Art Gallery and will be moving on to the Museum of Industry in New Glasgow and the Glace Bay Miners’ Museum in 2016. I am also investigating whether Nova Scotia schools would like to host the exhibit. I’m really pleased with how it’s turned out! It takes up minimal floor space and only requires access to an electrical outlet or extension cord to power the tablets. There are four themes: disasters (a history of mining disasters as articulated through songs), community (how disasters affect families and communities as well as miners), mass media (how the media inspires songs but also helps to disseminate them), and concerts (the importance of benefit and anniversary concerts). Each features 3-6 songs. 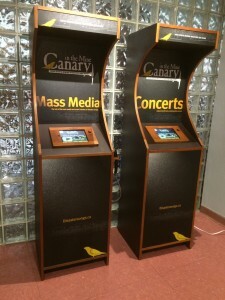 The songs can be heard using the audio “phone” on the side of each kiosk, and the lyrics can be read. Selected text in each song lyric is “clickable,” offering a tidbit of information about the song, the composer, the event portrayed, or disaster songs more broadly. There are also “stories” for each theme. Two characters were created for the exhibit: Joe MacPhee, a retired miner who was injured in the 1956 Springhill disaster and who witnessed both the 1958 Springhill disaster and the 1992 Westray disaster, and Gillian Long, a young singer songwriter born the day Westray happened and who discovers mining culture through songs. 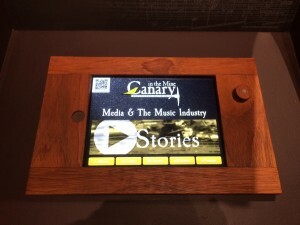 Each character has a short monologue on each tablet. The monologues articulate some of the major concepts related to each theme. Finally, what tablet experience would be complete without an interactive game? Visitors can test their understanding of the four exhibit themes by listening to song excerpts and deciding which theme each excerpt illustrates. Much as I would like to make the exhibit available on this website, the licensing fees for recorded music make that option financially prohibitive. Licensing is far less expensive when access is limited to in-person visitors who cannot download or otherwise copy the music in the exhibit. To help make the exhibit more relevant to teachers in the Nova Scotia school system, Eric Favaro developed a teachers’ guide aimed primarily at high school music teachers, but which also provides some suggestions for social studies teachers. The guide is freely available in the document library on this site. I will post the exhibit’s schedule as it evolves.